A team of Golden Retrievers from the Chicago-area Lutheran Church Charities (LCC) K-9 Parish Comfort Dogs have touched down in Boston today in the wake of the bombings that took the lives of three and injured more than 100 near the finish line of the Boston Marathon Monday, April 15. Hetzner says requests for a visit from the K-9 Comfort Dogs came pouring in to the LCC offices almost immediately after the brutal attacks Monday afternoon. One of the first was from a 9-11 survivor who moved to Boston in order to feel safe. Another urgent plea was from a concerned parent whose children witnessed the horrific explosions firsthand and have been suffering from intense nightmares. Monday’s events really hit home for members of the Lutheran community. Hetzner says that mere blocks from the finish line, where the bombings took place, is the First Lutheran Church, which is affiliated with the LCC. “The pastor [Reverend Ingo Dutzmann] asked if we would come to serve those in the community and those affected by the bombings,” Hetzner explains. The answer was an immediate and resounding “yes” from those involved in the K-9 Parish Comfort Dog program. “We’ll be right in the heart of it,” says Hetzner. Three Golden Retrievers and handlers from the Addison, Illinois organization boarded a United Airlines flight bound for Boston, including Luther, Ruthie and 6-month-old comfort puppy in training, Isaiah. 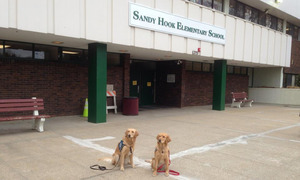 K-9 Comfort dogs Addie and Maggie have joined the pack in Beantown as well; the two Goldens have been serving in Newtown, Connecticut in the wake of the tragic shooting at Sandy Hook Elementary School in December. Hetzner and his LCC colleagues look forward to doing what they can to help the people of Boston recover after Monday’s devastating events. “It’s a chance to help bring some relief to people that are shaken up because of the bombings,” Hetzner tells TODAY.com. The LCC K-9 Parish Comfort Dogs and their handlers plan to remain in Boston until Sunday, but will prolong their stay if the community needs more time with the dogs. While the group plans to make the nearby First Lutheran Church their home base, they plan to visit a local hospital where those injured in the bombings are still being treated. The dogs will also be on hand during a memorial service at the First Lutheran Church planned for this Friday, April 19 at noon. For more information about the K-9 Parish Comfort Dogs or how you can help the organization fulfill their mission to help the city of Boston during this difficult time, visit the Comfort Dogs’ Facebook page.